Who doesn’t like free Ben and Jerry’s? Badger Alternative Break wanted a sweet reward for those who participated in the events of the Earth Week kick-off day: Friday, April 15, 2016. Johnson State College’s Badger Alternative Breaks doesn’t just send students on alternative breaks, they also hold pre-service trips and activities, as well as post-service. The environmental stewardship group that went to the Grand Canyon was in charge of putting together the events; members include: Rachele Funk, Renee Bonneau, Zach Levy, Shavonna Bent, Mikayla Turner, Abbie Casey, Bridget Giles, Carol Hassan, Becca Farrow, Erik Crosby, Heather White, and myself. The group wanted the activities to reflect what we had learned throughout our year of meetings and our trip. Events included litter clean-up, lunch with a park ranger, Leave No Trace education, games, paint the rock, hammocking, Ben and Jerry’s, and a dark skies talk by the Vermont Astronomical society. Multiple bags of litter were picked up by the morning crew, with the most common article of litter being cigarette butts. The Green Solutions club at JSC was granted over a dozen litter sticks to help improve the overall look and quality of the campus. Hassan, a sophomore at JSC and an Outdoor Education major, created a Leave No Trace educational tri-fold, as well as gathering LNT merchandise like stickers and fake tattoos for students and staff. LNT refers to outdoor ethics that rely on seven principles: plan ahead and prepare, travel and camp on durable surfaces, dispose of waste properly, leave what you find, minimize campfire impacts, respect wildlife, and be considerate of other visitors. “There were lots of student participants with the Leave No Trace booth. 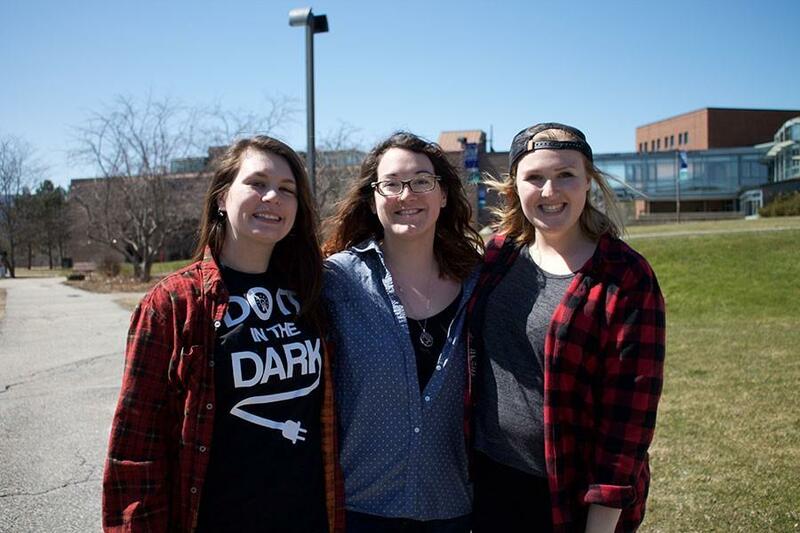 I thought it was fun because I am passionate about environmental issues and I want to spread the word about what ways we can treat our Earth better,” said Bonneau. Mint chocolate chip and strawberry cheesecake ice cream were donated to the group, and Funk and Bonneau set up shop in Dewey commons. Staff and students moved through the line for two hours and then proceded to sit on the south lawn near the volleyball net to enjoy the warm weather. “We really had a good turn out for all of the events and were approached multiple times with gratitude from staff. It was a good way to kick off a special week on campus,” Funk said.